Home Blog Underlined can make it easier and more fun: faster and better CX result! 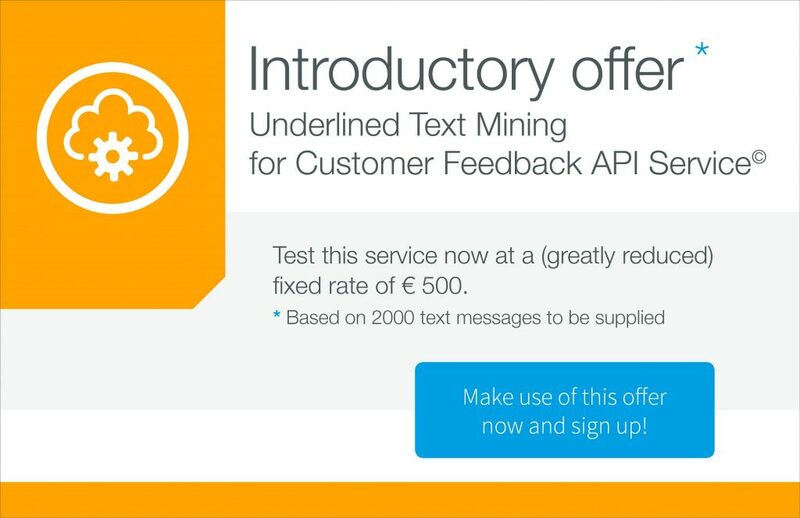 EASY & FUN: Faster and better CX results with the new range of Underlined API Services! CX is high on every manager’s agenda: the consumer is becoming increasingly demanding. CX results must be measurable and CX improvements applied exactly where most profit can be made. The CX battle is on. Speed is of the essence! CX is entering a new phase: the market is becoming more mature. This maturity is accompanied by a degree of standardisation. The vision of Underlined is that companies should no longer do everything themselves or outsource everything. There is a middle ground: namely the Underlined API Services. To help companies accelerate the achievement of CX objectives, Underlined has developed a new set of API services. These services are designed to fit as CX building blocks flawlessly into every CEM (Customer Experience Management) strategy as a turn-key project or an extension of the company’s own Data Science Architecture. The API services are scalable, accurate and flexible and connected to the Underlined Hub for CX Analytics ©, a collection/framework of machine learning and AI algorithms, which can be used directly as part of your CEM program. Many studies show that data collection and cleansing is the least favourite part of the data scientist’s work. Yet, this still takes up most of their day. A blog by Crowdflower suggests that they are little more than “digital janitors” mostly busy cleaning up data to prepare it for data analysis, rather than actually doing the analysis! “Anything your organization can do to give your data and machine learning teams the fuel they need to make a real difference should be a big priority. But Remember: They need good data and, as we’ve found in years past, they don’t particularly love munging and cleaning data either. It’s a waste of their skills to be polishing the materials they rely on. ” (Crowdflower). They hardly have time to mine and model data. Data scientists want to have an influence on the core business and they are not given the opportunity to do so. This has great detrimental effect in the entire organisation: everyone in the CX chain gets frustrated because there are insufficient results to show for their efforts. This is double trouble: the expensive data scientist is not contributing enough to the bottom line plus they are not motivated enough in their jobs to want to stay in the company! However, with the new range of Underlined API services, this problem is easy to tackle. The data scientist is released from mundane data collecting and cleansing tasks. They can practice their passion and contribute to CX improvements. This makes their work much more fun and rewarding!